cute and customized just for you! Your pup will be the talk of the neighborhood in this cute, customized bow. You can select the daisy letter you want - your furbaby's name, your family name, team, nickname, anything! A unique & adorable personalized bow! 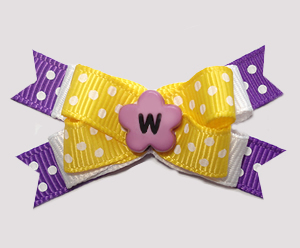 Please make 2 selections below (your choice of bow backing and letter), then add bow to your cart.